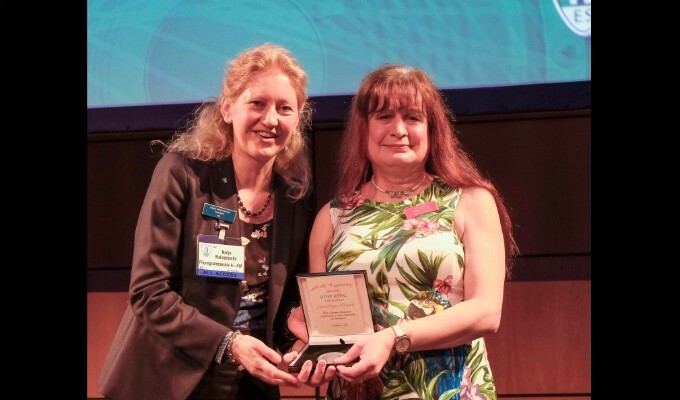 AES President Nadja Wallaszkovits presents the prestigious AES Silver Medal to AES Fellow Jamie A. S. Angus-Whiteoak for a lifetime of important contributions to audio engineering and instruction, and for outstanding achievement in the field of audio engineering. 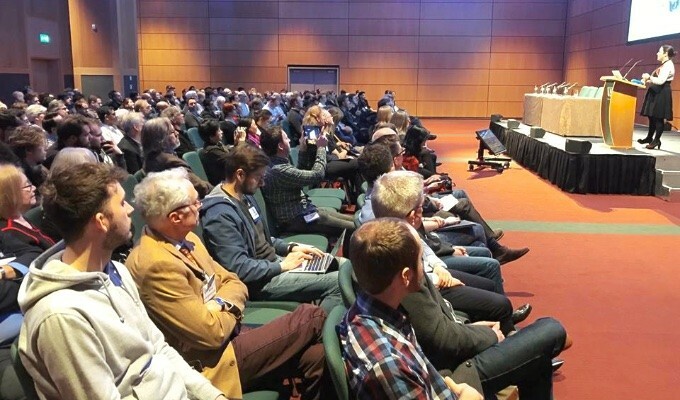 Exemplifying the best in audio engineering techniques and technologies, along with contributions to the Audio Engineering Society’s mission, the AES Dublin Convention Opening Ceremony proceedings included the presentation of a distinguished slate of awards. Presented by AES Awards Committee Chair Alex Case and AES President Nadja Wallaszkovits, the awards highlight outstanding achievements and contributions in audio engineering application, technology and to the Society, including the Board of Governors Award, Fellowship Award and Silver Medal award. Additional awards, presented by the Journal of the Audio Engineering Society Editor-in-Chief Bozena Kostek and Convention Papers Co-Chairs Roisin Loughran and Jamie A S Angus-Whiteoak, were given for the JAES Best Paper of 2018, Best Peer-Reviewed Paper and Best Student Technical Paper presented during the convention. The AES Board of Governors Award is given for outstanding contributions to the Audio Engineering Society. This year’s recipients, for Chairing recent AES Conventions and Conferences, include Paul Gallo (2 awards), Toru Kamekawa, John Krivit, Valerie Tyler, Christian Uhle and Yuko Watanabe. AES Fellowship Awards were presented for contributions to the advancement in or dissemination of knowledge of audio engineering or in the promotion of its application in practice. This year’s recipients are Joel Brito, for advancing the audio industry in Brazil and Latin America through decades of broad contributions to the Society, and John Dawson, in recognition of his outstanding audio hardware design achievements and contributions to the AES over many years. The prestigious AES Silver Medal was presented to AES Fellow Jamie A. S. Angus-Whiteoakfor a lifetime of important contributions to audio engineering and instruction, and for outstanding achievement in the field of audio engineering. Best Peer-Reviewed Paper winners - Matteo Torcoli, Alex Freke-Morin, Jouni Paulus, Christian Simon, and Ben Shirley for their paper “Background Ducking to Produce Esthetically Pleasing Audio for TV with Clear Speech”. Best Student Technical Paper winner - Shelley Ann McCarthy Buckingham Coauthor and co-author Malachy Ronan for the paper “Factors Contributing to Gender Imbalance in the Audio Industry”. For more information on AES Awards, nominations, and previous winner visit aes.org/awards.